This is the current diary for bookings at Adderbury Institute. 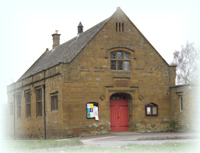 Adderbury Institute is available for hire by groups, individuals, organisations and businesses. To make your booking, create an account on our on-line booking system then log in and fill in the details. Your booking is there immediately and you can pay using your credit or debit card. Bookings need to be from the earliest point you require access to the building until the time you will have completely vacated the premises and can hand the key back. Therefore any set-up or clear-down time must be included in your booking. Your booking will be for a number of whole hours of which the minimum is 2 hours. We reserve the right to levy a charge for the storage of equipment in the building outside a booking period. If you wish to sell alcohol at your event you will need a licence to do this. To find out more please read the Sale of Alcohol Application document. This is our current scale of charges for the hire of Adderbury Parish Institute. If you use our on-line booking form the total cost of your booking will be calculated for you. This is included in the above rates. Included in the above rates. The Institute has a capacity of approximately 80 seated around tables.